In 1899 there was talk of the Great Central Railway being extended due west from Barton-on-Humber to connect with the proposed North Lindsey Light Railway from the expanding town of Scunthorpe. Immingham had not then been decided upon as the site of the G. C. Railway’s own port, and the redoubtable Sam Fay came to these parts to consider the possibilities of Ness End, for the depth of water off Chowder Ness was over thirty feet at low tide. In the event only the North Lindsey Light Railway scheme came to fruition, yet an official route map issued some years later by the East Yorkshire Motor Services Ltd. showed a long section of mythical railway west of Barton! 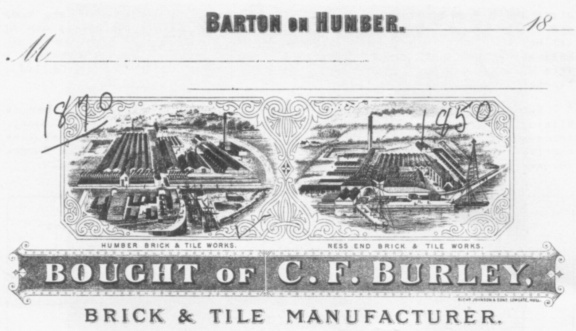 The Humber Brick & Tile Works were built by C. F. Burley in 1870 to the east of the Ness End Works. Most of its traffic was water-borne, and the twenty-foot wide creek accommodated three boats in line astern. The clay deposits were some twenty-five feet thick, but only the best clay was dug out to a depth of 4' 6". Originally there was no rail transport, and clay was barrowed somewhat laboriously by hand from the diggings to a dump at the works. In 1890 C. F. Burley’s son, William H. Burley, became Director and Manager. Three years later he negotiated a contract to supply the Wilmington Cement Works in Hull of George and Thomas Earle with three cargoes of blue clay a week for a period of six years (later increased) at a price of two shillings and sixpence per ton free on board. Shortly before 1900 (possibly in 1897) it was decided to mechanise the transportation of clay by the construction of a short railway which skirted the western perimeter of the works on its way from the claypits to a jetty on the creek. A removable bridge at this point gave rail access to the eastern part of the works. C. F. Burley's letter heading illustrates the two brick & tile works reasonably accurately - if not the locomotive! The inscriptions were made by William H. Burley when advising me of the correctness of the draft article. He was then in his 86th year. The "main line" finally attained a length of some fifteen-hundred yards, and was distinctly unusual for the district in that it was laid to the standard gauge of 4' 8½" so that it could be connected to the proposed G. C. Railway extension. Burley was able to finance the purchase of wagons but the cost of a locomotive was beyond him. Earle’s came to the rescue with one which they purchased from (it is believed) Whitaker Bros. Ltd. who had been using it in Hull on the construction of the Alexandra Dock Extension. For several years the square-sailed keels plied across the Humber to Wilmington Works, and also to the Stoneferry Cement Works of Burstall & Company, three-quarters of a mile up the River Hull from Wilmington. At first they carried no more that 100 tons, but by the turn of the century 140 tons formed the average cargo. The above map, based on observations and from information supplied by Mr G. M. Burley, shows the position about 1905. All the works have since been dismantled and the clay pits are full of water. The tramways at Ness End, West Field, Barton Tileries and the smaller one at Humber Works were cable worked (probably horse worked previously). Skelsey’s tramway was worked by locomotives and its history will be featured in a future issue. SYDNEY, about 1914, after transfer to Hessle Quarry. Notice the "G. & T. Earle, Hull" plate on the cabside. Expansion at Wilmington, which had exhausted the nearby Simpson’s Lane clayfield in Stoneferry before clay was obtained from Burley, resulted in G. & T. Earle Ltd. purchasing several acres of land at North Killingholme, near Immingham, about 1899. A few years later it was decided to concentrate clay-digging there with the result that shipments of clay from Burley ceased. Both Ness End and Humber Works closed down at about the same time and were subsequently dismantled completely, so that today only the water-filled claypits remain as a silent memorial to former greatness. SYDNEY left Barton about September 1913 for Earle’s newly opened-out quarry at Hessle, five miles west of Hull. It was not in too good a mechanical condition; on one occasion whilst unattended the handbrake failed to hold and SYDNEY ran away and off the rails. 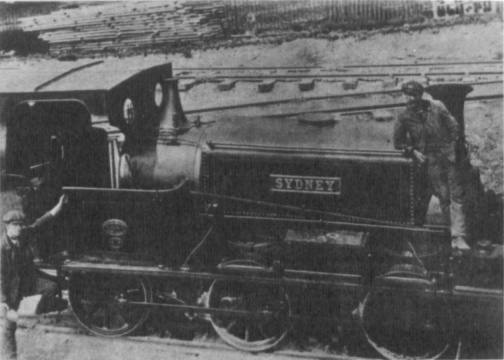 The arrival of ERNEST in February 1914 released SYDNEY to Wilmington Works where it was decided that the cost of repair was unwarranted. It is thought that SYDNEY was then cut up for scrap, but I have not been able to substantiate this point. I am indebted to the late William H. Burley whose recollections proved the basis for this article. Unfortunately, G. & T. Earle Ltd. have been unable to corroborate the historical information. 1 1886 may well be an error for 1884, as member Gordon Green informs me that on 20th May 1884 the Ness End Brick and Tile Company Ltd. was registered with a capital of £5,000 in £5 shares, to purchase the Ness End Farm and Brick and Tile Works, lately belonging to the London Architectural Brick and Tile Company Ltd. (in liquidation). The former title appears to have been an alternative to C. F. Burley which appeared on printed letter headings. C. F. Burley’s letter heading illustrates the two brick & tile works reasonably accurately - if not the locomotive! The inscriptions were made by William H. Burley when advising me of the correctness of the draft article. He was then in his 86th year. 2 According to the District Librarian shipments ceased in 1906, and the Works (?both) closed in 1907. W. H. Burley told me that both Works closed "about 1910". It appears that SYDNEY thus lay idle for at least three years as another Barton resident recollects that it was not removed until 1913.